The Second Edition of The Handbook of Financing Growth has been designed to help leaders and advisors gain a solid understanding of the financing strategies, sources, and transactions that will allow them to excel in such an unpredictable environment. Written by an experienced group of practitioners who operate within this dynamic marketand fully updated to reflect new market realitiesthis reliable resource outlines the full spectrum of funding alternatives currently available to emerging growth and middle-market companies and presents the practical strategies and techniques you need to be aware of when considering the capitalization, growth, or sale of your, or your client's, company. New material found in this Second Edition includes detailed discussions of positioning a business for value creation before the transaction and how your financing strategy fits into the overall plan for growing and raising capital as well as creating an exit. Among various techniques, the authors address buyouts and recapitalizations as two alternatives to create shareholder liquidity and potentially finance future growth. A new chapter on M&A addresses the acquisition process and how to fund acquisitions and external growth initiatives, while additional case studies highlight bank financing alternatives and growth equity. KENNETH H. MARKS is the founder and Managing Partner of High Rock Partners, Inc. He has been involved as a manager, advisor, and board member with over two dozen emerging growth and middle-market companies. Marks was a member of the Young Presidents' Organization (YPO) while growing his first company. He teaches in executive programs at Loyola University Chicago and North Carolina State University. LARRY E. ROBBINS is a founding partner of Wyrick Robbins Yates & Ponton LLP, a premier law firm located in North Carolina. He is a leading attorney in North Carolina middle-market financing and M&A transactions. Robbins received his BA, MBA, and JD from the University of North Carolina at Chapel Hill. GONZALO FERNÁNDEZ is a partner with High Rock Partners, Inc. and a retired vice president and controller of ITT's telecom business in Raleigh, North Carolina. He received a BA in accounting from Havana University, Cuba, and wrote the book, Estados Financieros (Financial Statements, Third Edition). JOHN P. FUNKHOUSER has been a partner with two venture capital funds and operated as chief executive officer of four companies in a variety of industries. He worked in commercial banking with Chemical Bank of New York, in investment banking with Wheat First Securities, Inc., and in venture capital with Hillcrest Group. D.L. WILLIAMS is a managing partner of High Rock Partners, Inc. As a CEO for over twenty-five years, he led three global manufacturing/technology companies through major transitionstwo of which he led the buyout of, working with private equity firms. As an advisor, he has worked with companies in numerous industries on growth, operational, and turnaround strategies to create value and implement change. Williams obtained his MBA from the Kenan-Flagler Business School at the University of North Carolina in Chapel Hill. 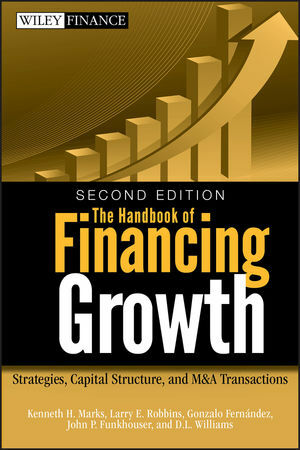 "The Handbook of Financing Growth, Second Edition remains the most important book on financing to be published in far more than a decade. If there is a way to do a business finance deal, it is covered in this book. Not only does the book explain how to do most all types of financing, it tells you why some companies succeed while others fail. The book is a true reference book that you can turn to when you need an answer, or when you need inspiration."